Brown University was in need of a Financial Management software that goes beyond the basics of accounting and would focus on strategic insights, agility, speed, and costs. They chose Workday as the solution, and Collaborative Solutions to partner with. Located in historic Providence, Rhode Island and founded in 1764, Brown University is the seventh-oldest college in the United States. The University has a student population of more than 8,000 and 5,100 faculty members. At its foundation, Brown was the first college in the United States to accept students regardless of their religious affiliation. The Ivy League’s engineering program, established in 1847, was the first in what is now known as the Ivy League. Brown’s New Curriculum, adopted by faculty vote in 1969, eliminated mandatory "general education" distribution requirements, made students "the architects of their own syllabus," and allowed them to take any course for a grade of satisfactory or unrecorded no-credit. Brown needed to unify information that was confined in multiple, dissimilar systems. The University relied on many manual financial processes and its data was stored across several systems, further reducing efficiency. Brown University was in need of a Financial Management software that goes beyond the basics of accounting and would focus on speed, cost, agility, and strategic insights. The Ivy League school struggled with a limited number of finance and accounting capabilities, delayed business insights, and managing business assets. 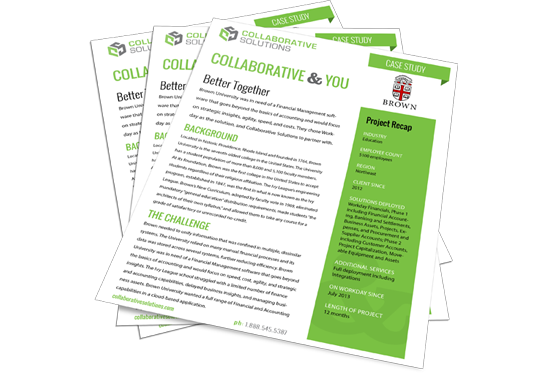 Brown University wanted a full range of Financial and Accounting capabilities in a cloud-based application. Collaborative Solutions partnered with Workday on this multiphase project to deploy the full suite of Workday Financial Management. In Phase 1, Collaborative Solutions led efforts on Financial Accounting, Banking and Settlements, Assets, Projects, Expenses, and assisted Workday on Procurement and Supplier Accounts. This went live after 12 months in July 2013. Phase 2 included Customer Accounts, Project Capitalization, Moveable Equipment and Assets, and went live in a staggered 12 month deployment in July 2014. Deploying Workday Financial Management functionality and new business processes resulted in reduction of manual steps and data in disparate systems, increasing the customer’s access to information and the ability to make business decisions with accurate data. Specifically, Brown University now has complete visibility into payment processes, cash flow, financial reporting, and business assets. It now has reduced the time spent collecting, consolidating, and reconciling data from fragmented systems. Tangible and intangible assets are easily defined, tracked, and accounted for with Business Assets, and Brown can more accurately forecast cash flow with embedded analytics. The University now gets immediate visibility into financial performance with real-time, comprehensive financial and functional reports. Today, Brown can also embrace process, organizational, and reporting changes without business disruption. Perhaps most importantly, Brown University has been provided with a consistent and easy-to-use interface for all users, including employees, supervisors, executives, and auditors. Brown University was in need of a Financial Management software that goes beyond the basics of accounting and would focus on strategic insights, agility, speed, and costs.